This past four-day weekend found me in a meeting. As I sat looking at my notes, I pushed up my glasses and my fingers brushed against something hard next to my temple. All thoughts of commenting left me. Upon further exploration, I found it attached to my hair! I fought the immediate urge to scream maniacally while visions of critters danced in my head. (Have you seen how much hair I have on this head?) I finally worked the piece out only to find I had no clue of what it was. Even though my head felt like a thousand bugs were crawling in it, I knew it wasn’t nits. I took a moment and gave thanks. 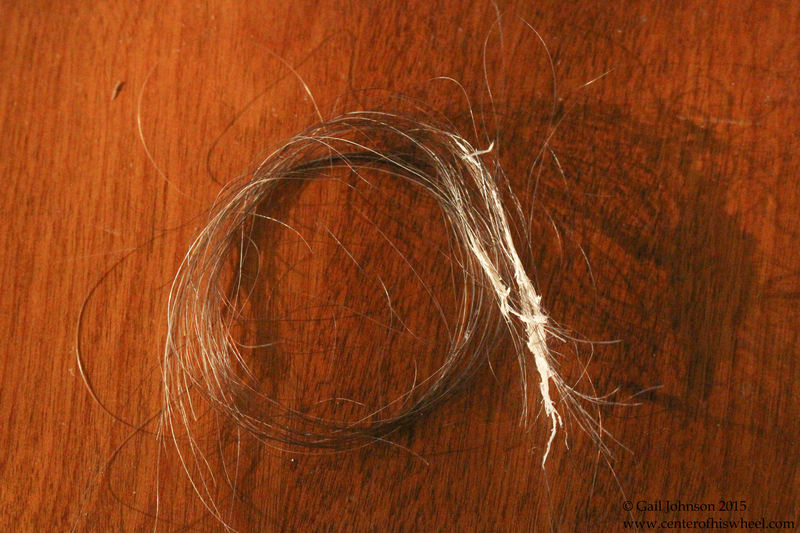 After examining the foreign substance, I calmly began searching the rest of my hair. Sure enough, there were smaller pieces attached throughout the strands. Finally, the appointment ended, and I hurried home to investigate. The first place I looked was my head! After brushing—pulling—out the tiny pieces, I found a larger piece at the base of my neck. Eventually, I pulled it out. Then I parted my hair down the middle, pulled it forward and found a wad around the occipital bone. To save myself a lot of hurt, I cut that piece out. Next place I went was to my hot iron. And there I found my answer. At the top of the barrel was a cooled substance from a plastic container sitting on my sink. Sigh. Thankfully, hair grows back! Plastic, heat and hair don’t mix well! Bless your heart! Hello, Shauna. 🙂 It is a universal truth! But unfortunately, I have to find things out for myself, at times!